~ You want to practice some of the patches you don't use all the time -- like quarter square triangles, flying geese and the square in a square patch. 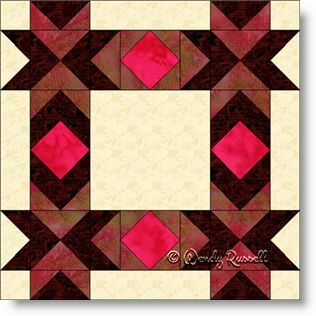 This quilt block is constructed first as individual patches, then as "chunks" and finally as an uneven nine patch. So all in all it is a great learning tool. The sample quilts illustrated use the standard side by side setting with sashing and an on point setting, giving similar but still very different results.